In this series of blogs, we explore the key capabilities in Office 365 and SharePoint to create business solutions, with a primary focus on PowerApps. Instead of listing the functionalities, we help you build a PowerApp. Even though PowerApps is still in “Preview,” it continues to evolve at a rapid pace. A recent addition to the product: the ability to create PowerApps through the browser interface. While each version brings better functionality, I thought this would be a great time to do a bit of a deeper dive into some of the technical features of the product. I could certainly list out those functionalities, and provide a description, but that is completely boring. Just building a PowerApp would be much more fun! So, let’s say I have decided to quit technology altogether and open a chain of restaurants across the United States. I plan to offer decent food at ridiculously low prices, but also allow each restaurant to create their own menus based on a specific set of food items. However, each restaurant will use a new Menu Management PowerApp to create and submit their menus to me for approval. To store my data for the new Menu Management PowerApp, I’m going to leverage SharePoint lists to store the data. Why use SharePoint for this? My data architecture will not be overly complex. Since it’s a part of my Office 365 subscription, there is no additional cost. Whereas setting up a SQL Database on-prem, or in Azure/AWS would incur additional overhead. It’s much easier to manage than an SQL database. 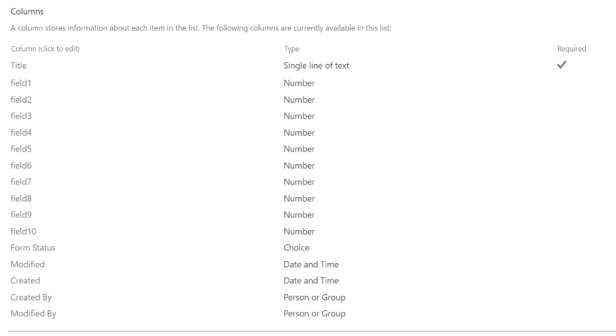 With the recently released Modern SharePoint Lists in Office 365, integration is pretty simple to set up and maintain. 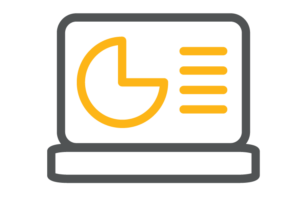 This list will contain necessary data for each Menu item that will be available for the users to select for their menu in the Menu Management PowerApp. Title– Comes by default with a custom list. Will be used to store the title of each menu item. Description – Multiple lines of plain text. Will store a description of each item. Section – Will store a value of: Appetizers, Salad, Entree, or Dessert, depending on the menu item. This was originally a choice column, but there are some limitations currently between PowerApps and SharePoint around choice columns. I’ll discuss this more in depth later on. 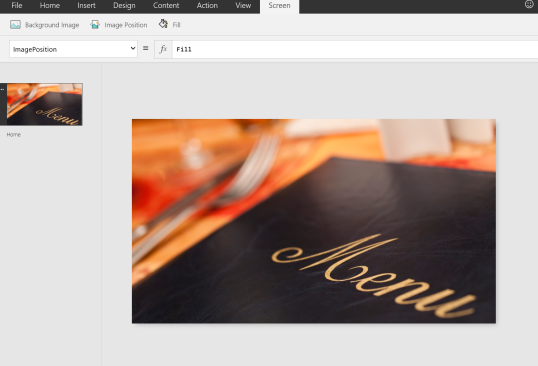 Image – this will store a link to an image of each menu item. There is currently a limitation wherein PowerApps cannot display images that are hosted in SharePoint. 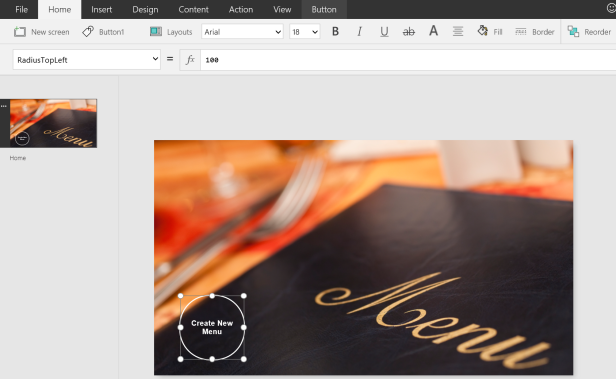 For this example, all links will be to images hosted outside of SharePoint. This list will contain all of the captured values from the PowerApp for the submitted menu, as well as status information on the request. Title – This will be the name of the menu that is created. field1-field10 – These fields will hold the value of each item selected. You will notice that the type of these columns is ‘Number.’ This is because I plan to save the ‘ID’ of each menu item that is selected instead of the title. I usually prefer to use the ID, as it is always unique and easy to work with. This is just a personal preference, but it will also demonstrate some features of PowerApps as we build that functionality in. Form Status – This is a choice column that will be used by our back-end workflows as the menu arrangement. I have populated these lists with some sample data as well. But enough with SharePoint for now, let’s make a PowerApp! So, as I prefaced at the beginning of the article, Microsoft is now offering an additional way to create PowerApps: through a browser-based GUI. From my current experience with both tools (browser and desktop), the functionality is extremely close as far as the admin experience goes. The desktop client does offer more out-of-the-box templates as of today, but that will change as the browser version matures. I’m going to use the Universal App to create my PowerApp, but feel free to use whichever version you are more comfortable with, or the version that is compatible with your Operating system. Since this will be the first screen that appears when the PowerApp is started, I’m going to add a background image, and some navigation buttons. As we add new screens, we’ll wire up each button to allow navigation to occur when clicked. To change the background image of this screen, just click the ‘Screen’ tab at the top of the ribbon, and then click background image -> add an image file. In the case of my button, I changed the RadiusTopLeft, RadiusTopRight, RadiusBottomLeft, and RadiusBottomRight all to a value of ‘100.’ This creates a circle if you resize the button. I also set it to ‘No Fill’ and added a 3px white border. Am I a UI/UX expert? No. But this demonstrates you can do a bit more than just the defaults. 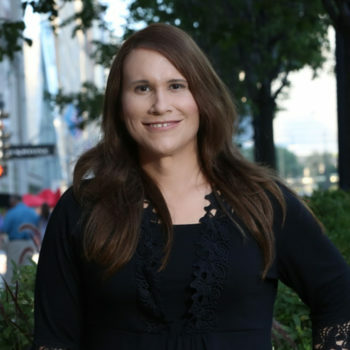 Jo Karnes is a National SharePoint Architect. With more than 15 years of experience working with Microsoft technologies, Jo not only brings a wealth of knowledge in Microsoft SharePoint but also in enabling technologies that allow SharePoint to integrate and perform well. Should Your Organization Replace InfoPath Forms with PowerApps? Moving to Microsoft Office 365 is about more than migrating email to the cloud. It’s about digital transformation and workplace collaboration. That’s where our Enterprise Collaboration Practice comes in. We focus on all aspects of the adoption lifecycle and go beyond technical configuration to drive successful, long-term adoption of Office 365.